The interpretation of Exodus 4:24-26 is very controversial. Scholars have treated this text from various viewpoints on the basis of divergent methods or approaches. Two fundamental problems cause uncertainty about the origin and meaning of this text. One problem has to do with the nature of Exod 4:24-26. Another problem is the identity of the persons mentioned in Exod 4:24-26. 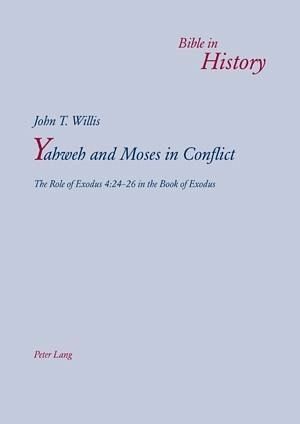 This book arranges forty-two documented interpretations under each approach or approaches, presenting the view of each scholar proposing his/her interpretation of Exodus 4:24-26 in chronological order. The author presents his own view in the concluding chapter, essentially adopting a redactional, canonical, narrative, rhetorical methodology. The Author: John T. Willis received his BA in Greek in 1955 and MA in Old Testament (1956) at Abilene Christian University. He received his PhD at Vanderbilt University in Nashville, Tennessee (1966). He taught Hebrew Bible at David Lipscomb University in Nashville, Tennessee (1956-1971), and at Abilene Christian University in Abilene, Texas (1971 to the present time). The author has written approximately 30 books and 100 scholarly articles in Old Testament studies. He has been Associated Editor of Old Testament Abstracts for many years. Contents: Early Jewish Explanations - Early Christian Views - Ideological and Psychological Criticisms - Source Criticism, Form Criticism - Contextual, Sociological Explanations - Neglected Circumcision - Redaction Criticism, Narrative Criticism, Rhetorical Criticism, Canonical Criticism - Recurring Conflicts between Yahweh and Moses.